Camphor Overdose is the accidental or intentional intake of the substance in dosage higher than prescribed values. Camphor Overdose may be also referred to as Vicks VapoRub Overdose. What are the Causes of Camphor Overdose? What are the Signs and Symptoms of Camphor Overdose? The signs and symptoms of Camphor Overdose can vary from one individual to another. It may be mild in some and severe in others. Several systems of the body may be affected. In small doses, camphor can cause heart and lung problems. In large doses, the substance is highly toxic and can lead to fatalities. How is First Aid administered for Camphor Overdose? 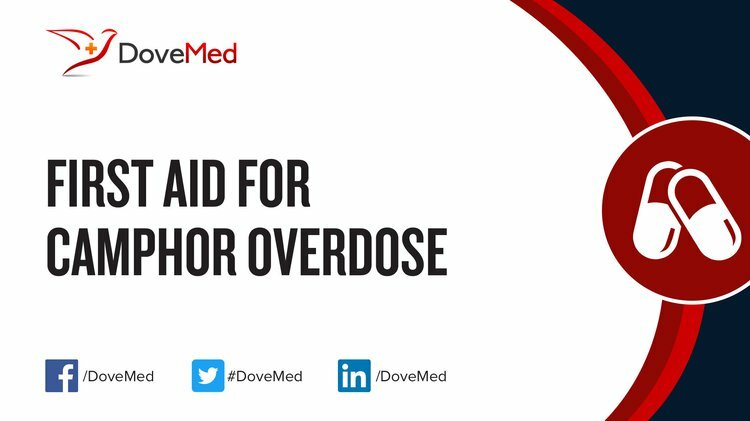 Who should administer First Aid for Camphor Overdose? First aid for Camphor Overdose is administered by healthcare professionals. What is the Prognosis of Camphor Overdose? How can Camphor Overdose be Prevented? Dlimi, F., Rhanim, A., Lahlou, A., Kharmaz, M., Ouadghiri, M., El Bardouni, A., ... & El Yaacoubi, M. (2012). Bilateral anterior dislocation of the shoulders at the start of a backstroke competition. Journal of Orthopaedics and Traumatology, 13(1), 47-49. Dlimi, F., Mahfoud, M., Lahlou, A., El Bardouni, A., Berrada, M. S., & El Yaacoubi, M. (2012). Bilateral anterior shoulder dislocation with bilateral fractures of the greater tuberosity: A case report. Journal of clinical orthopaedics and trauma, 3(2), 122-125. Thakur, A. M. I. T., Gupta, R. O. M. I. T., Kotwal, V. I. S. H. A. L. I., & Arora, D. E. E. P. A. K. (2010). A rare case of bilateral anterior dislocation of the shoulder. Journal of Clinical and Diagnostic Research, 4(6), 3567-3569. Botha, A. H., & Du Toit, A. B. (2010). Bilateral anterior shoulder dislocation: a case report of this rare entity. SA Orthopaedic Journal, 9(4), 68-70. Ballesteros, R., Benavente, P., Bonsfills, N., Chacón, M., & García-Lázaro, F. J. (2013). Bilateral anterior dislocation of the shoulder: review of seventy cases and proposal of a new etiological-mechanical classification. The Journal of emergency medicine, 44(1), 269-279. Siu, Y. C., & Lui, T. H. (2014). Bilateral anterior shoulder dislocation. Archives of trauma research, 3(4). Choulapalle, R., Chokkarapu, R., Kolluri, R. K., Anne, S. R., Perumal, S. R., Avadhanam, P. K., & Bheemanathuni, R. (2015). A case of neglected bilateral anterior shoulder dislocation: a rare entity with unusual mechanism of injury. Case reports in orthopedics, 2015. Wong, A. (2016). Camphor/eucalyptus/menthol/methyl salicylate overdose. Reactions, 1598, 54-23.